About a year and a half ago, I stumbled upon this post on teaching US geography to a toddler. Honestly, I can’t even remember how I found it…was is linked on someone’s blog or maybe I saw it on Pinterest. Either way, I knew right away that I wanted to implement this method with my own kids. 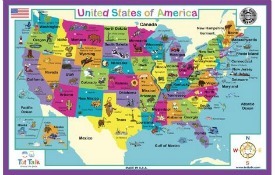 The idea is that you use a US map placemat to help teach your kids the names and locations of the states. Basically, you place some kind of small treat (Cheerio, raisin, nut, etc.) on one state at a time, the child says the state’s name and then they eat the treat. At the beginning, you say the state then they simply repeat the state’s name to get their treat. We’ve adapted the idea to fit our family with four children involved. We place two United States Map placemats and a bag of Cheerios (or Cheerio equivalents) on the table after breakfast. 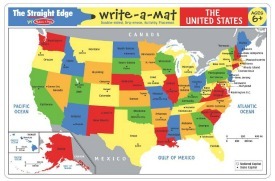 We have simple map placemats (similar to this), but there are also ones like these with images of what each state is known for. Since there are two kids on each side of the table the pairs each share a placemat. I place two Cheerios on a state on each placemat. For example, I put two Cheerios on California on each placemat. That equals four Cheerios total (or one each for four kids). Our kids then raise their hand if they know the name of the state. Once the state has been correctly identified all the kids say the state’s name and then claim their Cheerio. We repeat this process starting first with states we already know and adding in one or two new states at a time. I normally set the kitchen timer for 4 or 5 minutes and clean up once the timer goes off…a short and sweet geography lesson. Mom Confession: We’ve taken a break from our US Geography “Map Game” since Isabelle was born. I need to stock up on Cheerios and get back into our practice. It’ll be interesting to see how much the kids remember. Have you ever used educational placemats to teach your kids? What other concepts do you think could be taught this way? 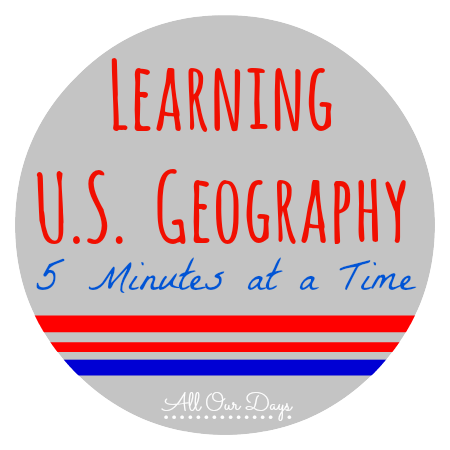 Do you have any other tips for teaching Geography? What a great idea! My girls love maps, and I’d love to be more intentional with them. I’m so glad you like the idea. Our kids really enjoy it! I love the idea of having kids outline the states to reinforce their learning. My son is only 1, so he’s not quite there to learn states. But, I will definitely be using this method. He loves Cheerios. So, this is perfect! For now, I can probably use this method with colors or animal placements. Thank you for sharing this! 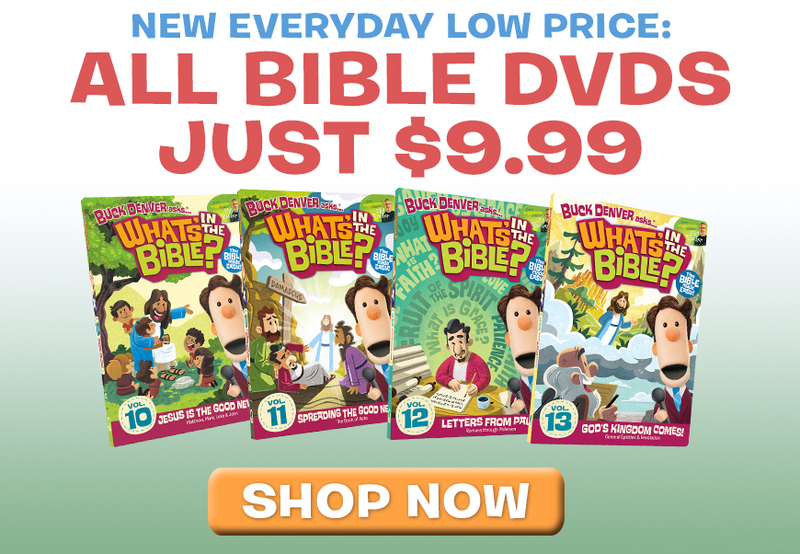 You can definitely use this same method for learning letters, numbers, shapes, and colors. Love this idea. We do something at our home called 20 minutes a time…simple activities that can educate and build confidence for our kids at the same time…just starting to post about it. Thanks for sharing this easy idea! I’m glad you like this idea. I’d love to hear more about the other things you do. What a great idea! My son especially loves putting together our jumbo state puzzle.